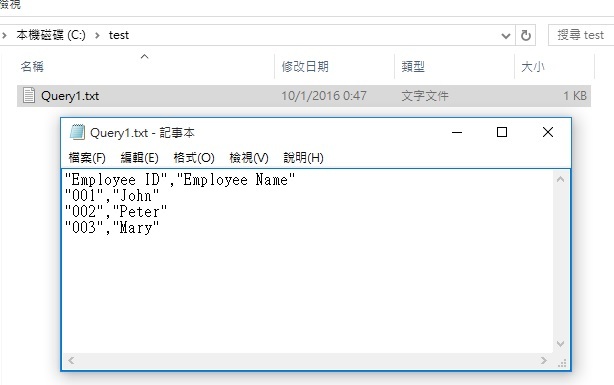 This Access VBA tutorial explains how to import and export Access Objects to text using DoCmd.TransferText Method. TransferType Optional AcTextTransferType The type of transfer you want to make. 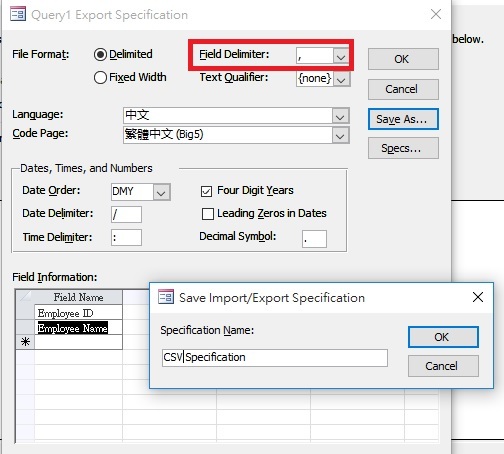 You can import data from, export data to, or link to data in delimited or fixed-width text files or HTML files. The default value is acImportDelim. Only acImportDelim, acImportFixed, acExportDelim, acExportFixed, or acExportMerge transfer types are supported in a Microsoft Access project (.adp). SpecificationName Optional Variant A string expression that’s the name of an import or export specification you’ve created and saved in the current database. For a fixed-width text file, you must either specify an argument or use a schema.ini file, which must be stored in the same folder as the imported, linked, or exported text file. To create a schema file, you can use the text import/export wizard to create the file. 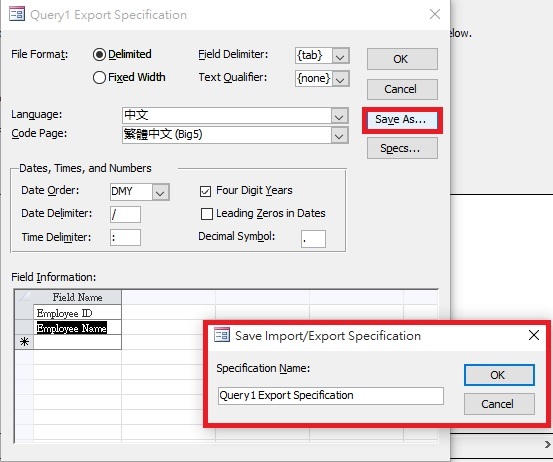 For delimited text files and Microsoft Word mail merge data files, you can leave this argument blank to select the default import/export specifications. 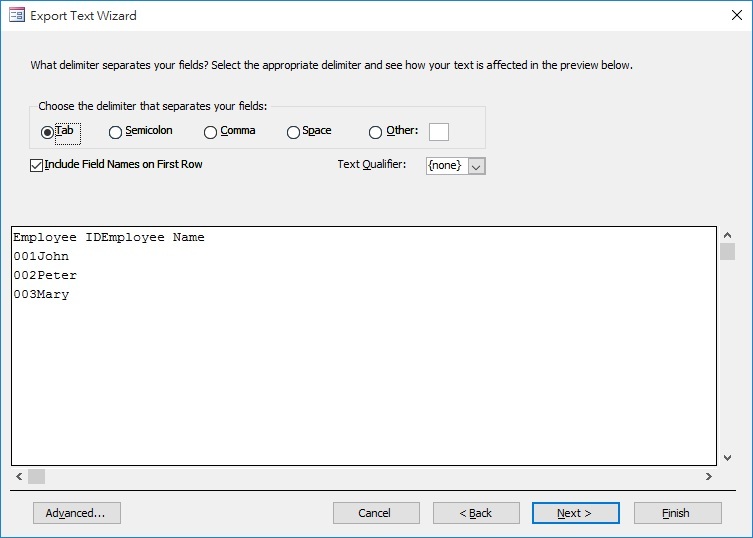 TableName Optional Variant A string expression that’s the name of the Microsoft Access table you want to import text data to, export text data from, or link text data to, or the Microsoft Access query whose results you want to export to a text file. FileName Optional Variant A string expression that’s the full name, including the path, of the text file you want to import from, export to, or link to. HasFieldNames Optional Variant Use True (–1) to use the first row of the text file as field names when importing, exporting, or linking. Use False (0) to treat the first row of the text file as normal data. If you leave this argument blank, the default (False) is assumed. This argument is ignored for Microsoft Word mail merge data files, which must always contain the field names in the first row. HTMLTableName Optional Variant A string expression that’s the name of the table or list in the HTML file that you want to import or link. This argument is ignored unless the TransferType argument is set to acImportHTML or acLinkHTML. If you leave this argument blank, the first table or list in the HTML file is imported or linked. The name of the table or list in the HTML file is determined by the text specified by the <CAPTION> tag, if there’s a <CAPTION> tag. If there’s no <CAPTION> tag, the name is determined by the text specified by the <TITLE> tag. If more than one table or list has the same name, Microsoft Access distinguishes them by adding a number to the end of each table or list name; for example, Employees1 and Employees2. CodePage Optional Variant A Long value indicating the character set of the code page. The below Procedure exports Query1 to the C:\test\ folder. The file will contain field name in the first row. By default, text files exported via DoCmd.TransferText Method contain double quote around the data and field name. There is no argument in the Method that we can use to remove the double quote, fortunately there is workaround using Specification argument in the Method. Now add one more parameter SpecificationName to the Procedure. There is no argument in DoCmd.TransferText Method to define how data is separated, whether by comma, semi colon, tab, etc. Instead we should define it in the Specification first. As explained earlier, export a Query in the non-VBA way, press Advance button to define a Specification. For details refer to my previous post. You can either create a blank Table in Access that will be used to import the TXT file, or let the Macro generate a new one for you. Again, you have to specify whether the text file is delimited by semi colon, tab, comma etc using the previously created Specification. Run the below Procedure. While FileName <> "" And Right(FileName, 3) = "txt"
Great post! It helped me a lot, thank you! However, how do I get rid of the 0.00 decimal places in .csv file? Is there a way to get only round numbers? Thank you! Hello, i’m french so don’t look at my english ! Its’s realy well , but i need to import several txt file one by one in différents table temp, it ‘s to extract and treat each file with a query. I’ve got 50 txt file per day. Hi, do you mean you want to import 50 text files in Access with individual table name? Hello, yes, a txt file have 130 lines, i import one Field with fixed lenght 71. I have to execute a query to transform 130 lines in one (query is ok) and add it in a table. I just need a loop to create a tbl_temp to each txt file and delete it after the run query. I’am just begining with VBA. Thank a lot to get your time to my probleme ! Hello, yes it’s what i want (2) with the code to delete each tbl_temp after the query run. Thanks a lot ! Any way to convert the records into an XML format?